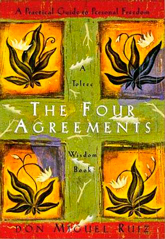 In 1997, Don Miguel Ruiz, a Mexican author of New Age spiritualist and neoshamanistic texts published a book with the magic title “The Four Agreements – A Practical Guide to Personal Freedom”. This book can be considered as his most famous and influential work, and has sold around 4 million copies. In “The Four Agreements”, Don Miguel Ruiz gives four principles to practice in order to create love and happiness in your life. Adopting and committing to these agreements seems to be simple but actually living by and keeping these four Agreements can be one of the hardest things you will ever do. It can also be one of the most life changing things you will ever do. As you practice living by these four practices your life will dramatically change. In the beginning these new habits will be challenging and you will lapse countless times. With practice the agreements become integrated into your being and every area of your life and become easy habits to keep. Marston Hill intercultural center for quality of life is both a physical location in Mullsjö, Sweden and a network and forum where people can contribute information about phenomena which could help us achieve a higher quality of life. This site contains information about and links to such phenomena.